Every manufacturer of laminate flooring provides very specific instructions on the proper method of installing their product. Laminate flooring is designed to be installed by the DIY home handyman who is capable of completing simple home improvement projects. There are however, some common dos and don’ts that apply to the installation of any laminate floor. Surprisingly many people ignore these instructions, believing that they know better than the manufacturers. Laminate flooring must acclimatize to your home. This is done by placing the boxes in the room where you are going to install the laminate for a minimum period of 48 to 72 hours. Failure to do this will cause floors to buckle. Note: In the room does not mean in the house or garage! It means, precisely what it says. The laminate must be allowed to acclimatize in the room where it is to be installed. Additional information on acclimatizing flooring products. There must be a gap between walls and any other obstacle, (columns, stair risers, heat vents, etc.) of between 5/16″ and 1/2″ depending on the manufacturer. This allows for the expansion of the floor. If a gap is not left, the floor will buckle. If the laminate flooring is going to be installed on a concrete slab floor where there is earth below the concrete, a vapor barrier must be placed between the concrete and the laminate. The seams should be taped with a moisture resistant tape. Laminate flooring should not be installed on any floor that has a drain. Some manufacturers will allow the installation of laminate flooring on carpet. The carpet should be a hard twist (Berber), or a very low pile (commercial carpet). If the underlayment is spongy, the flooring will separate when walked on. The smallest piece of flooring should never be less than 8 inches long and the width should never be less than 2 inches. Measure your room before you start the installation as it may be necessary to cut the first board in length and the first row of boards in width to avoid having small pieces. Joints should be staggered a minimum of 16 inches apart and a minimum of 3 rows for repeating of the joint. If installing base board or quarter round on top of the laminate, do not nail through the laminate. The nails must be driven in a horizontal plane to the floor, not vertical. A laminate floor must be allowed to expand and contract. Repair any and all squeaks and soft spots in the sub-floor before installing the laminate. 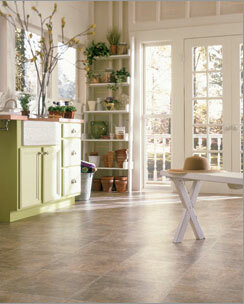 Laminate flooring will not correct squeak or soft spot problems. Do not continue the installation of laminate flooring through a doorway that is less than 48 inches in width, use a transition molding. Do not hammer on the groove end on the board – ever! Always start the installation of the laminate flooring with the groove side and end towards the walls. Always use a tapping block to help tighten joints, but do not over hammer or you will damage the surface of the laminate at the joints. Floors must be level, no more than 3/16” slope over a ten foot span. Floors must be flat. Any dips in the floor should be filled in with self-leveling compound and left to dry at least 72 hours. Read and follow the manufacturer’s instructions and you will end up with a quality floor that will last for years.